HOW TO STUFF A WILD BIKINI, the sixth entry in American-International’s “Beach Party” series, attempts to breathe new life into the tried-and-true formula of sun, sand, surf, songs, and corny jokes. Frankie Avalon and Annette Funicello are still around as Frankie and Dee Dee, but in this go-round they’re separated; he’s in the Navy stationed on the tropical island of Goona-Goona, while Annette has to contend with the romantic enticements of Dwayne Hickman . 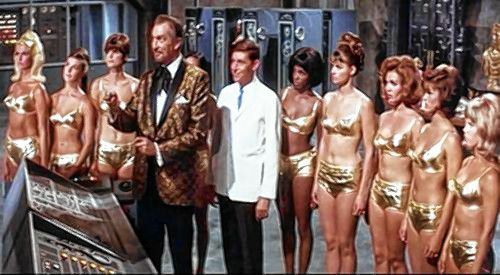 American-International Pictures, never ones to shy away from jumping on a trend, released a pair of secret agent spoofs starring the one and only Vincent Price as the evil supervillain Dr. Goldfoot. AIP president James H. Nicholson himself allegedly came up with the story, wanting to use the film as a showcase for wife Susan Hart, a beautiful woman of limited talent. 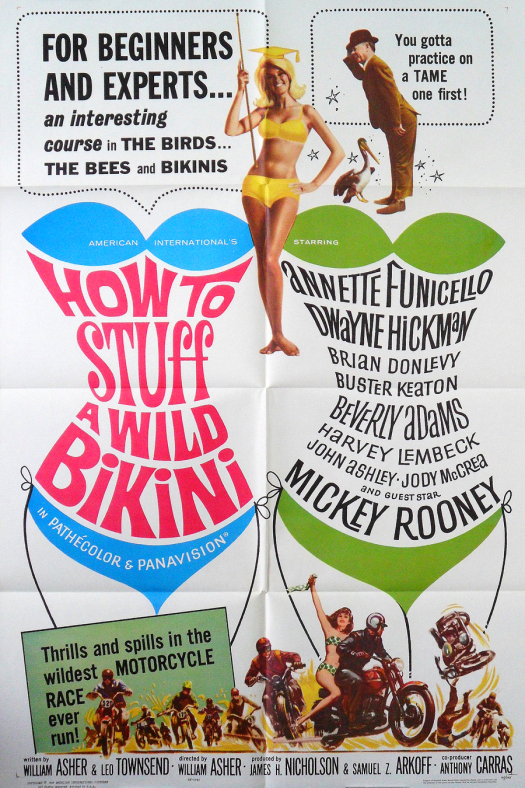 The first was DR. GOLDFOOT AND THE BIKINI MACHINE, an endearingly goofy little movie co-starring SKI PARTY’s Frankie Avalon and Dwayne Hickman. The two even use the same character names from that previous film, Tod Armstrong and Craig Gamble – only reversed, with Frankie as Craig and Dwayne as Tod! 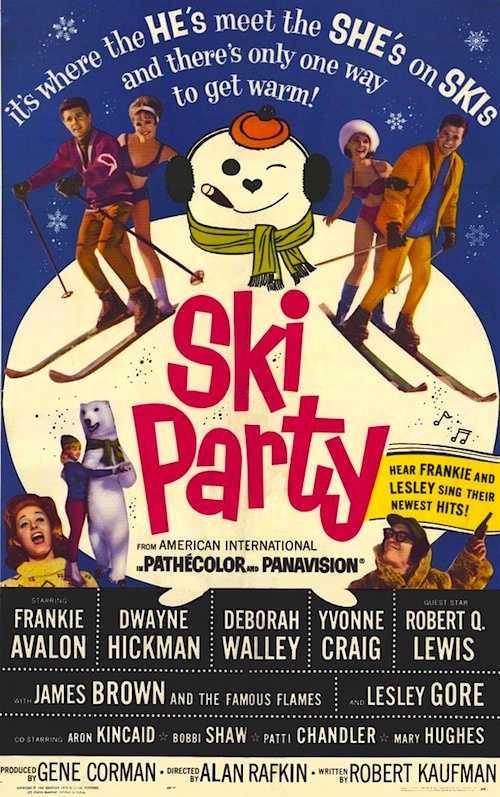 American-International Pictures takes the “Beach Party ” concept to the slopes in 1965’s SKI PARTY, an endearingly goofy ball of fluff headlining Frankie Avalon, Dwayne Hickman, Deborah Walley , and a pre-‘Batgirl’ Yvonne Craig . It sells itself with a sly wink to the audience that says, “We know the whole thing’s absurd, and we don’t care”! Besides the off-the-wall comedy, the film features above average musical interludes by guests Lesley Gore and the Godfather of Soul himself, James Brown. The year is 1962. Lights flash over California and the news on the radio is bad. What everyone feared has happened. Atomic war has broken out and the world is about to end. Refugees clog the highways as a mushroom cloud sprouts over Los Angeles. This is year zero, the year that humanity will either cease to exist or try to begin again. Harry Baldwin (Ray Milland) and his family were among the lucky ones. They were camping in the mountains when the war broke out. Harry does not hesitate to do what he has to do to make sure that his family survives. Harry alone understand that this is a brand new world. When a local storekeeper refuses to allow Harry to take any goods back to his family, Harry takes them by force. While his wife (Jean Hagen) worries about whether or not her mother has survived in Los Angeles, Harry’s teenage son and daughter (Frankie Avalon and Mary Mitchel) try to adjust to the harshness of their new situation. Harry may now run his family like a dictator but his instincts are proven correct when the Baldwins find themselves being hunted by three murderous, wannabe gangsters (Richard Bakalyan, Rex Holman, and Neil Nephew). This is year zero. 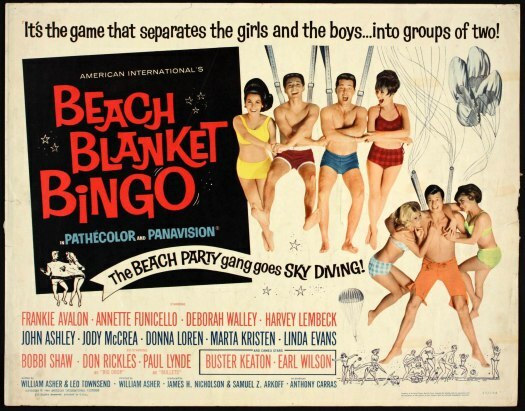 You’d think by the fourth entry in American-International’s ‘Beach Party’ series, 1965’s BEACH BLANKET BINGO, the formula would be wearing a bit thin. Frankie and Annette are still trying to make each other jealous, Eric Von Zipper and his Rats are still comic menaces, and the gang’s into yet another new kick (skydiving this time around). 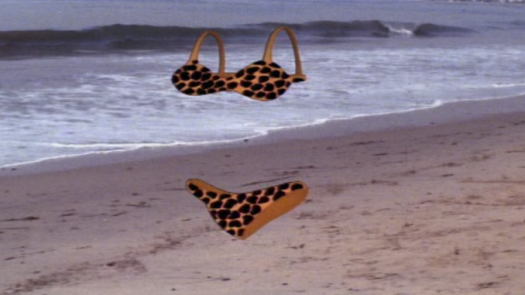 But thanks to a top-notch supporting cast of characters, a sweet subplot involving a mermaid, and the genius of comedy legend Buster Keaton , BEACH BLANKET BINGO is loads of fun! 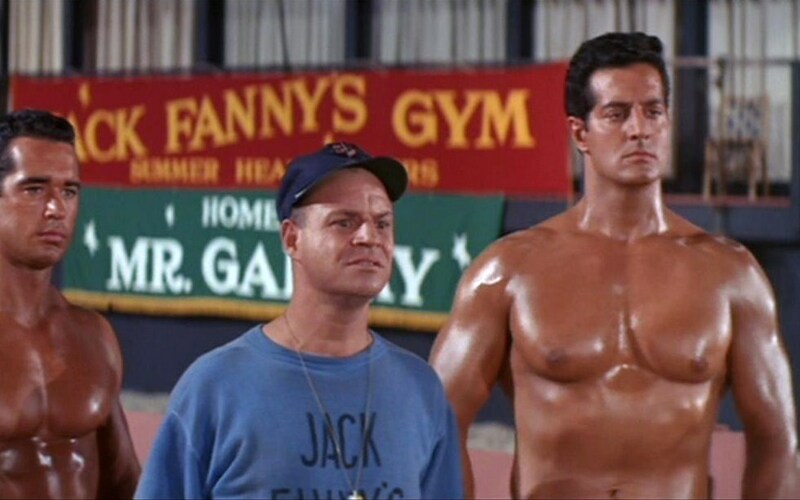 The “Beach Party ” gang’s back and so’s the familiar formula in MUSCLE BEACH PARTY, second in the American-International series. It’s Easter vacation and Frankie Avalon is still horny, Annette Funicello’s still waiting for marriage, and a beautiful foreign woman is again coming between them. This time it’s Lucianna Paluzzi as Countess Julie, a rich heiress who wants to make Frankie a singing star and her personal property.